'Aunt Rose' (Joseph Musacchia, R. 2010) Seedling 00-62-2. LA, 42" (107 cm), Midseason bloom. Standards blush pink; style arms yellow green; Falls mauve pink, edges darker, yellow green signal. R. Goula seedling X 'Bob Ward'. 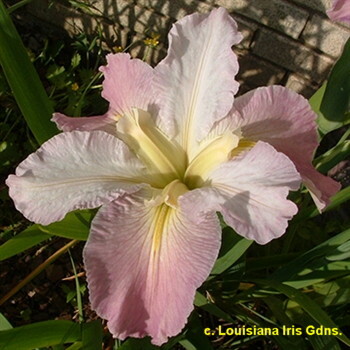 Louisiana Iris Gardens 2011.